It’s a blizzard of optimism out there, at least in my little corner of the world. It’s snowing ideas and blowing energy, exhilarating rather than draining me. Funny comment from me, because I despise the winter in the northeast US. Can’t bear my inevitably cold feet, hands and nose or the poor posture that comes from bending my body inward to keep warm. Dislike the heat that dries out my skin, fear the ice hiding under layers of white and gray, abhor cleaning the snow off the car while shivering under my jacket. No ambiguity about this topic; my feelings are clear and straightforward. But I sense something circulating in the atmosphere that is making the snowflakes appear to me like an infinite flock of gentle-winged birds carefully delivering a new moment of possibility. I want to run outside, rejoice in their shower, dance in their snowfall. I want to invite my friends to come out and play like we did when we were young and delighted in the novelty of that precipitation that could transform into solid masses of balls and snowpeople and igloos, then become the source of countless hours of creative fun. More senseless than sensible, my sense, perhaps. It certainly is not grounded in a global perspective, which I know quite well since the documentary and corporate video production work in which my husband Curt and I engage regularly bring us to many destitute and endangered places around the world. Yet neither these ever-disturbing realities nor the barrage of daily international news reports are smothering this feeling inside me, humming in this little corner of mine, luring me into the white blanket outside my door, beckoning me to explore so many wonderful creative opportunities that lost their way through routine over time. State of emergency declared in NJ. Garden State Parkway and the airports are closed. The wind is beating at the windows and the temperature is dropping. The snow is almost higher than our dog’s height, making it hard for him to do his thing. Inside, the candles are burning and the heat keeps us cozy. On second thought, I’m kidding about playing in the snow. But that doesn’t diminish the positive karmic feelings that prompted the blog!!! This entry was posted on December 26, 2010 at 9:15 pm and is filed under Uncategorized. You can follow any responses to this entry through the RSS 2.0 feed. You can leave a response, or trackback from your own site. Nice piece – I share your sentiments. 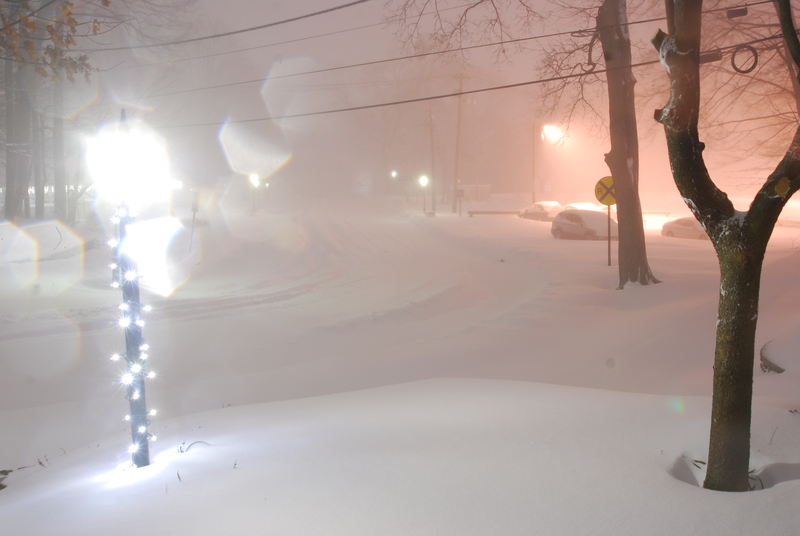 Also, the photo looks like the front of our house (also in NJ), right down to the light-wrapped lamp post! Have a great New Year, and thank you for the blog comment. I love your positive perspective for 2011. Let’s go play in the snow!! !